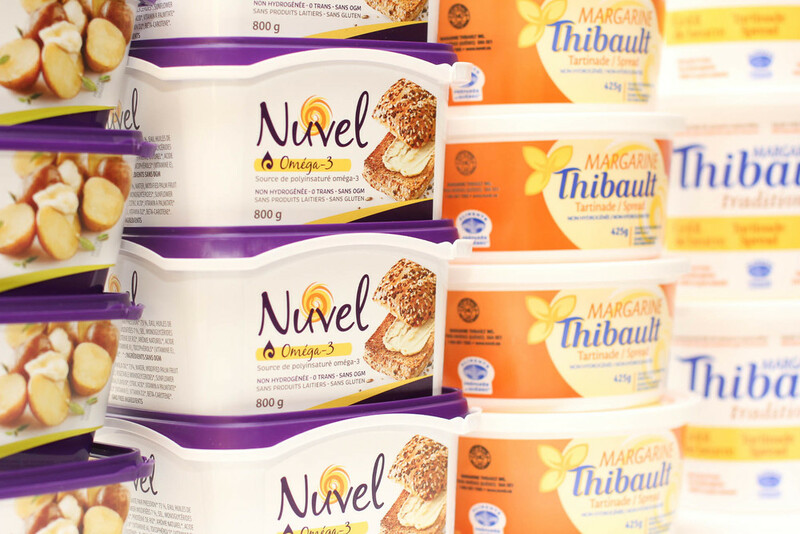 Margarine Thibault — Located in Trois-Rivieres, Quebec — is the only manufacturer of margarine and spreads in the province. we have been making products of outstanding quality for over 100 years. Great spread, great for cooking, great for your health and above all, great taste! Our margarines are perfect for all your recipes. Vegan and GMO free, our Nuvel is the only real choice for a healthy breakfast. Don't forget to try our Thibault and Bergeron margarines, too. We know that working in the kitchen is as demanding as it is important. Our wide range of healthy products — conscientious of intolerances and allergies — make your work easier. Here, you will find a detailed overview of our products. Thibault is about more than just margarines, spreads and oleo butters; we also provide a wide array of bakery products. Our baking margarines and shortenings are behind some of the best bakery and pastry products used daily by thousands of Canadians! Our lab and expertise can benefit you! Margarine Thibault elaborates custom spreads and margarines for private retail brands as well as for the food hotel industries. Need ideas? We got plenty!